Bath Mats and Shower Mats are essential to help prevent slipping in the bath or shower and when it comes to Bath Mats and Shower Mats, at Byretech we have it covered ! 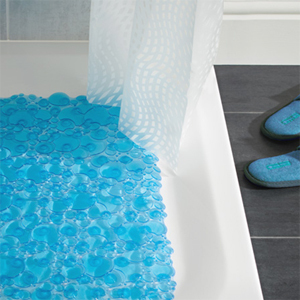 If you are worried about slipping in the bath or shower, then a suction Bath Mat or Shower Mat is a must. It gives you that essential extra grip between your feet and the Mat to make sure that you don't slip and hurt yourself. Whilst you're looking - we also stock a great range of Grab Rails too ! From the simple square Bath Mat to the multi coloured Shower Mat deigns, when you need a Bath or Shower Mat the choice here is simply brilliant. We even have Bath Pillows that match, helping you add extra style in your bathroom.